For businesses with a WordPress website looking for the best ecommerce solution, WooCommerce is almost always the top choice. About 3 million websites use WooCommerce, and it has become the most popular ecommerce plugin for WordPress over the past five years. Our reason for making this WooCommerce guide is to help you, our readers, understand the wide range of possibilities available in building an ecommerce WordPress website using the WooCommerce plugin. If you aren’t familiar with the plugin, WooCommerce allows WordPress sites to sell digital or physical products and facilitates the transactions that make this possible. It’s important that you understand the advantages and can explain them to everyone on your team. If you have any feedback on this piece, or think we should create more in-depth guides to ecommerce solutions, please drop us line! We decided to break down this guide all about creating and using a WooCommerce store into 4 sections. As a full service web development/digital marketing agency, our Chainlink team has helped numerous businesses create online stores using WooCommerce and make the best of them. WordPress ecommerce sites using WooCommerce have optimization capabilities that aren’t possible with some other popular ecommerce solutions. We’ll walk you through what to do to get your online store off the ground if you choose to build it using WordPress and WooCommerce (and the initial set-up shouldn’t take you long at all). If you are developing and launching a WordPress website for your online business for the first time, your priority is to set up the site correctly. You have to select a hosting provider that supports WordPress and purchase a domain name that fits your business. You also have to acquire an SSL certificate and ensure that the servers you’re using are optimized for WooCommerce if you want optimal site speed and performance. 2) Choose the best WordPress/WooCommerce friendly website hosting package for your needs. 3) Get an SSL certificate. 5) Download the WooCommerce plugin. Let’s say you already have a WordPress website and you simply want to add the WooCommerce plugin to give it ecommerce capabilities. You still want to work with your development team to make sure your WordPress site is running well before adding the WooCommerce plugin. It’s wise to audit your existing site and run some tests (like a site speed test) to see if there is anything you can do to improve it before adding WooCommerce and the other add-ons and extensions that could slow it down. 1) Run the Setup Wizard to complete initial installation and follow the steps that follow. – Where your store is located and which currency to accept: This is especially important if a portion of your target customers are outside of the US. 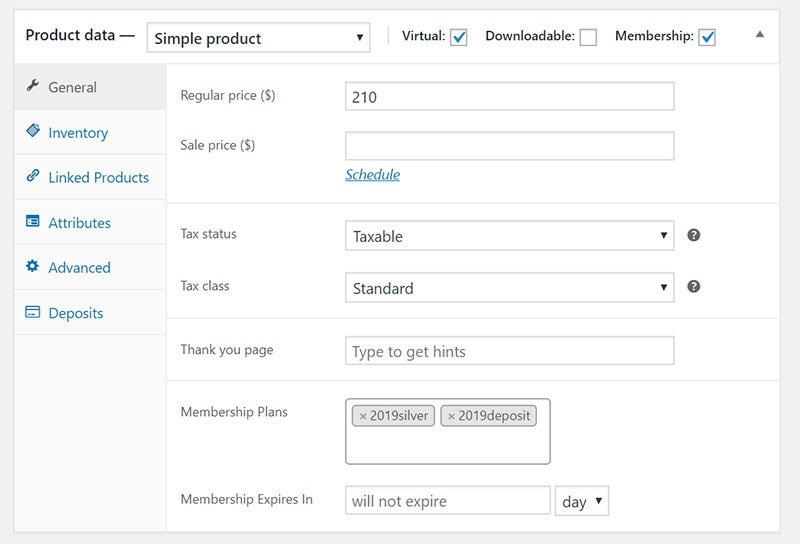 – Shipping and tax setup: You decide and dictate your shipping terms, but the WooCommerce plugin actually automatically calculates and adds taxes to your products’ prices accordingly. – Payment gateway details: Unlike some of the other popular ecommerce platforms out there (like Shopify) which limit the number of payment methods your customers can use, WooCommerce supports multiple payment gateways from PayPal to Stripe. Click “Products” under the WooCommerce navigation menu, and then click “Add New”. Add the title of product where it says “Product Name”, and then add your description to the new product you just added. These details are what website visitors will be able to see for that product on your site. If you scroll down the page, you’ll also see a box entitled “Product Short Description”, which allows you to write a brief description that website visitors can see under the product title/name when browsing multiple products on a web page. 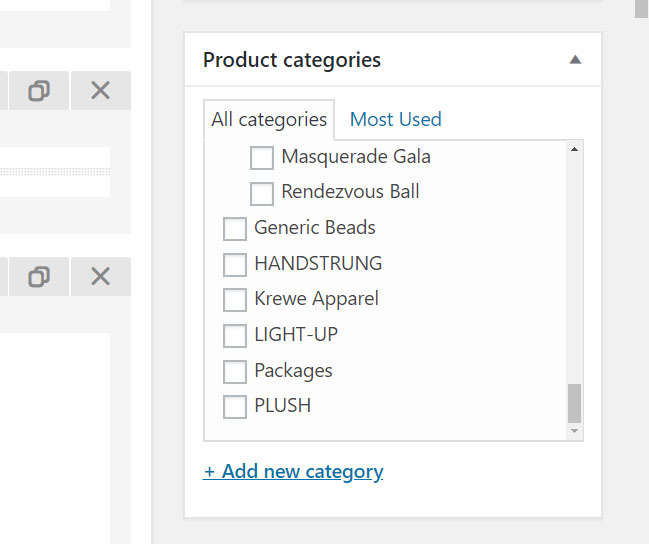 You can create and assign categories and subcategories to organize your products and make them easier to browse. To add a product category, navigate to the “Product Categories” box on the product page and click “Add New Category”. To specify information about your product such as pricing, inventory, shipping and more, navigate to the box that says “Product Data”, which you can find below the main editor on the product page. It’s crucial that you fill out this information. In most cases, your products will be “simple” products. Grouped products refer to product bundles in which a customer is required to purchase certain items together as a package deal. Labeling a product as a variable product allows you to allow a set of variations on one product realted to price, image, etc. – General: Provide product price and sales price (if applicable.) You can also set up whether it’s a taxed product as well as its tax class. Shipping: Weight, dimensions, and shipping classes are configured here. – Linked Products: In this menu, you can include related products that will get recommended as up-sells or cross-sells. – Attributes: This is where you define custom product attributes like color, size, etc. When you have set up attributes, you’ll also see the the “Variation” menu item, which allows you to offer variations of your goods. – Advanced: Here you can add a custom purchase note that will be sent to customers after purchase, change the product order inside the menu and determine whether to allow reviews. 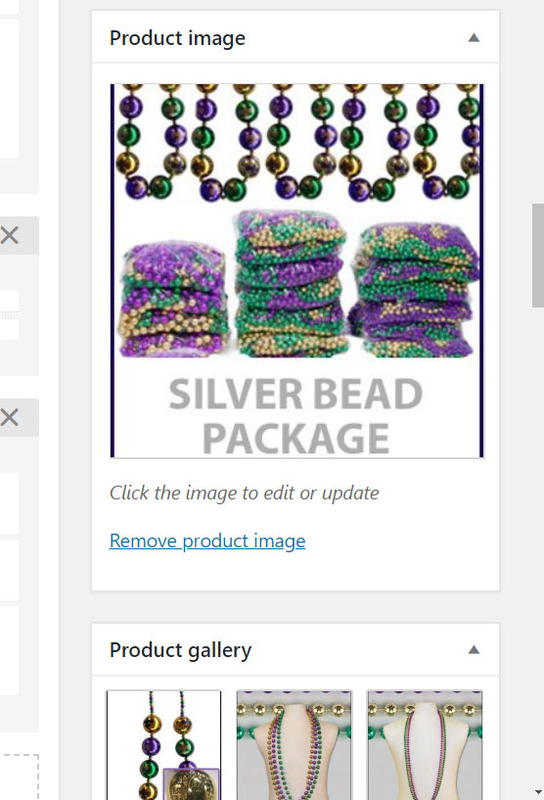 Add and remove images of your products as needed on the right hand side of the product page where you see “Product Image” and “Product Gallery”. Whatever you upload under “Product Image” will automatically display on the individual product’s page and serve as the product’s featured image on the main product page. The “Product Gallery” option allows you to add additional images to show variations (i.e. to display different colors, sizes, or angles) of the same product. WordPress websites can look extremely different depending on their themes. 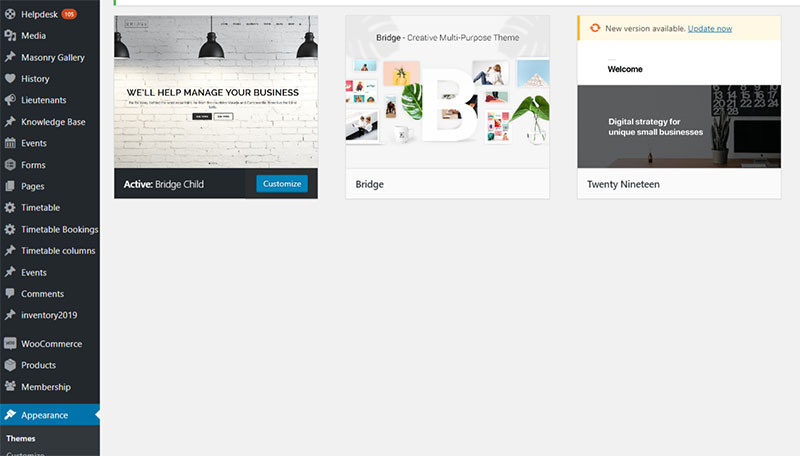 Whether you choose to use a paid or free theme, chances are you’ll want a web development team to help you make customizations to the theme to perfect how your store is organized and products displayed. 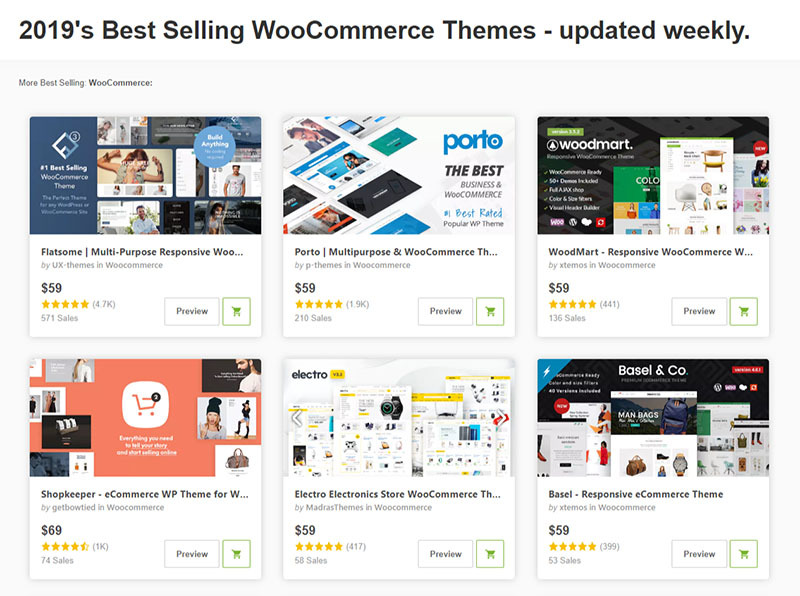 There are plenty of digital stores, such as https://themeforest.net, that sell WordPress themes designed for WooCommerce. To preview different theme options from the backend of your WordPress site, click “Appearance” and then “Themes”. To change different basic theme settings, click “Appearance” and “Customize”. WordPress offers a wide array of free and paid extensions, especially for its most popular plugins like WooCommerce. Some of these extensions streamline basic actions like the checkout process. Some extensions offer additional capabilities, such as enabling your online store to integrate with your social media marketing efforts, or to help with upselling, cross-selling, and email marketing. We’ll talk more about the wide variety of WooCommerce plugin extensions (many of which are free) later in this guide. Regardless of what these WooCommerce plugin extensions offer, be sure it’s going to add value to your online store. If you have too many extensions that aren’t really helping you increase sales and slow down your website or cause bugs on your site, they could be causing more harm than good. Take a look below at some of the extensions included in one of the ecommerce websites we built using WooCommerce. You can see plugin extensions such as a Product Sales Report builder, a CSV import and export extension, and an extension for custom order fields. After you have your WooCommerce store up and running, your next thought is probably, how am I going to make the user experience as foolproof, fast, and seamless as possible? A website that is quick to load and easy to navigate will be appreciated by online shoppers and help you sell more products faster. The goal is a lower bounce rate. 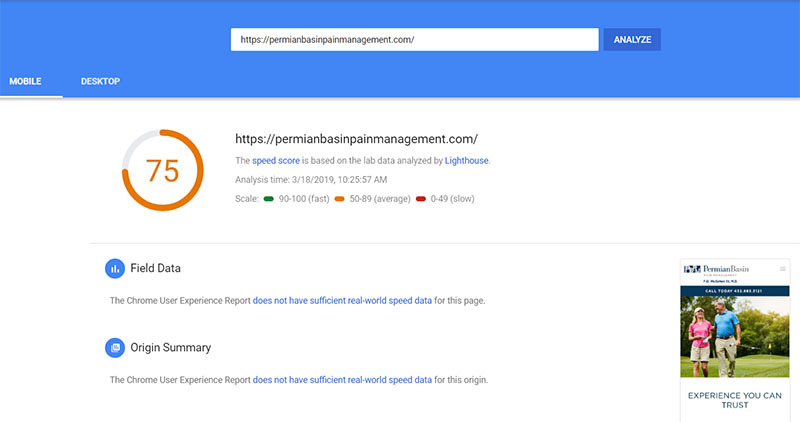 You can check your website speed using Google Page Speed Insights. 2) Use a cache plugin. 5) Improve your hosting package or provider. Increasing your website’s memory limit is something that your web development team may or may not already be aware of and handling. Either way, it’s important that you know about it and your team knows about it. “WordPress memory size exhausted” is one of the most common errors that WordPress site owners receive, and it can be prevented by increasing the PHP memory limit in WordPress. If you don’t have programmers to help you, it’s still totally a doable task (even for people who don’t consider themselves tech savvy). This WordPress Beginners blog spells out exactly what to do. WooCommerce offers free performance tracking (it’s built into the plugin). 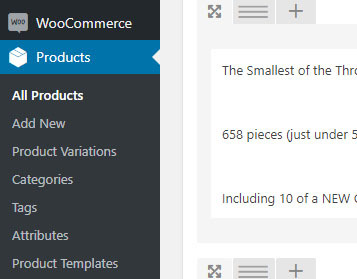 If you want to constantly improve your online store and stay a step ahead of the competition, it’s useful to take a look at the analytics provided under the “Reports” section of your WooCommerce plugin (directly viewable in the backend of WordPress). You’ll see graphs and data mapped over time about products and sales. Then, if you look under “Customers”, you’ll see data about things like customer acquisition and when you click “Stock” you can check up on your inventory status. WooCommerce stores open up possibilities for your online business in ways that other platforms usually can’t. Once your WordPress website is built and the WooCommerce integration is complete, you’ll want to stay on top of how WooCommerce is a driving force fueling some major trends that could benefit your business. 1) You can sell digital products, physical goods, or both. 2) You can take payments using the provider that’s best for your business. There are 100+ payment gateway choices for WooCommerce. 3) You have a ton of options for customizing cart/checkout features, and for making your store compatible with multiple currencies, tax rules, etc. (which can be especially useful if you have an international customer base). 4) You can easily add discount promotional codes or create special offers (which can be especially useful during seasonal or annual sales). 5) You can include special capabilities to your store for a reasonable cost, such as the ability to make your sales model subscription-based, or to try a dynamic pricing strategy. 6) You can choose between dozens of shipping options to select what will work best for your online store’s needs. 7) You can integrate WooCommerce with email, social, and other marketing reporting tools, both free and paid. For example, integrating with Google Analytics provides you and your team with valuable insight on how to improve your sales process and the store overall. 8) You can extend WooCommerce to create an online store that is truly customized to the vision you have for your customer’s shopping experience. 9) You can stand out from your competitors in a positive way by creating a store and experience that doesn’t rely on standard or generic themes and preset customization options like some other ecommerce platforms do. This recent blog highlights 51 WooCommerce compatible/responsive WordPress themes. 10) You can sell on Amazon and eBay directly from your WooCommerce store for free. Now, let’s take a look at some of the current trends and features in the ecommerce world that you have the ability to take advantage of as a WooCommerce store owner. Building an online store on WordPress using WooCommerce allows you to add a live chat support or chatbot to your site (oftentimes for free), which can take your customer interactions to the next level. 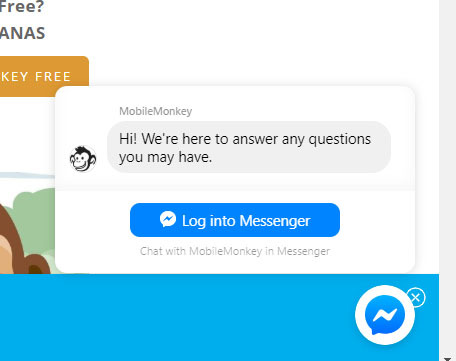 For example, you can link up your ecommerce store support with Facebook Messenger absolutely for free thanks to certain WordPress plugins. You could also opt for the automated responses that can answer quick questions for your customers using a chatbot plugin like WooCommerce ChatBot. With the trend of immediate support (and an increased demand for highly personalized online experiences), it makes sense that there are plenty of plugins and WooCommerce extensions available, both free and paid. Key Tip: Live chat support might not be the most sustainable form of quality customer engagement/support if you’re a rapidly growing company with not enough employees to respond to questions. Sometimes there are options to let people know your company’s average response rate, so that your site visitors don’t feel neglected if you don’t respond right away. It’s in every online store’s best interest to have a mobile optimized website that makes viewing product pages, entering payment information, and completing checkout a fast and easy process. Mobile friendly customer interfaces make it natural for customers to start their buying journeys on their computers, and then make purchases on their iPhones (or vice versa). WordPress has WooCommerce compatible themes that are automatically mobile friendly, which can save you and your development team a lot of time. 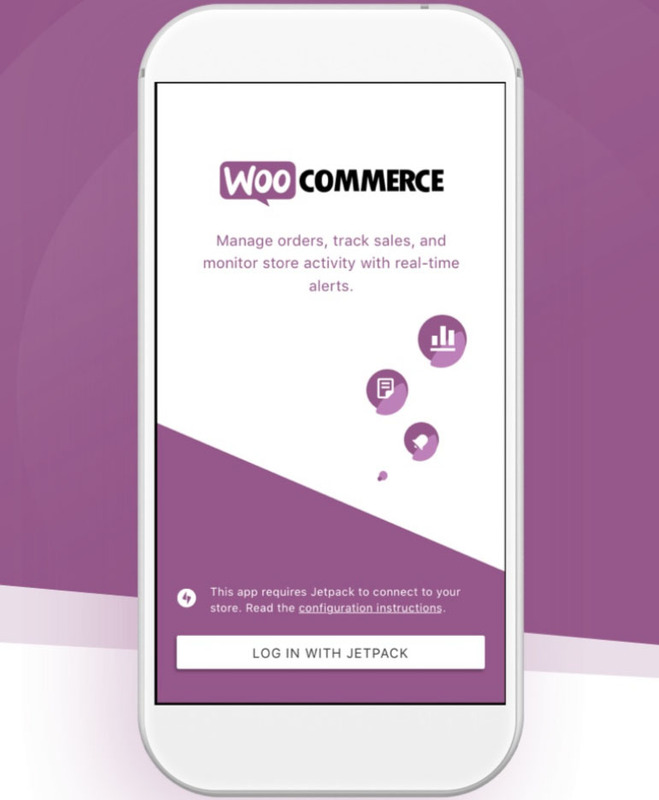 Also, a new development this year for WooCommerce is the release of its mobile app, which lets WooCommerce store owners track their products’ performance, manage orders, and receive order alerts in real time. With this free app, busy business owners can look at key metrics, notifications, and more on their smartphones. Online shoppers are starting to expect more from product image displays, and a WooCommerce store built on WordPress has the ability to offer more elaborate and interesting product page creation options for online store owners. The online shopping experience demands a higher caliber of product descriptions (and more detailed, keyword-rich copy) as well. Enhancing product pages pays off because it’s becoming and more and more of the norm. Video and/or more advanced product images are now becoming increasingly commonplace. Check out this WordPress/WooCommerce powered online shop for energy bars. Redd Bar was able to show what the different bars look like under their wrappers using a special image display feature thanks to the customization flexibility that WordPress allows. Personalizing your customers’ shopping experiences is a more involved process today than it was previously because consumers have higher expectations. Think about it from the perspective of your own online shopping experiences. Nowadays, you almost expect that you’ll have the option to create an account, log in whenever you make a purchase, and have your preferences saved (especially if you’re a regular customer). When you build your ecommerce store using WordPress and WooCommerce, you can provide discounts to loyal customers with extensions like WooCommerce Memberships. WooCommerce can help you create highly personalized experiences. You can customize your products with inexpensive add-ons that give you even more control of how items in your store are displayed and sold. You can mold your customers’ shopping experiences based on what you know about them as individuals, and how that should influence their buying journeys. However, here is a word of caution: knowing a customer’s preferences, location, and shopping behavior is powerful but can seem invasive if the shopper realizes that you have access to all of that information about them. In short: use the information to your advantage without creeping people out. There are ways to personalize WooCommerce for different customer types without revealing too much about how much you know. It’s one thing if your business is successful based on the season or the marketing/advertising campaigns that you are running, but creating sustainable long term success as an online business is challenging. WooCommerce stores are completely scalable, but the only catch is that you have to be diligent about updates. If you have a lot of WooCommerce plugin extensions that are outdated either because you’ve been ignoring them or you think updating them could mess with or slow down your site, you could be stunting your own store’s growth. Maybe you were right to delay a plugin update, but eventually you need to follow a few steps to get everything up to speed the right way. Digital store management is about being organized and staying one step ahead of potential issues at all times. Creating a consistent schedule for managing and maintaining your online store is key in order to protect your business and your users from the difficulties that come from an outdated site. Regularly check and update the status of your stock of physical products. Your WooCommerce inventory informs decisions you’ll have to make about improving how your products are displayed online. It’s important to remove digital/downloadable products or promotions that are no longer relevant. However, if you delete a digital product, beware of the broken link it could create. Make a calendar for website management check-ups. Set reminders for backups and site restoration, and automate updates when appropriate. Let’s say your WooCommerce store is set up and optimized properly, you’re frequently selling products, and you and your team are satisfied with the website’s overall performance. However, the positive performance of your website’s store is reliant on how often you update WordPress theme and plugins, too. Everything could be going great, but if you let too many add-ons become outdated, or rush to update everything at once, you can put your site in jeopardy. Protect your website from security threats and create a sustainable, positive customer experience. The only way to make your WooCommerce store’s success sustainable is by proactively steps to maintain your WordPress website. You might want to download a WordPress management plugin to help you figure out which plugins can auto update and which plugins/themes you should manually update. Taking the precaution of manually updating plugins can save you major time and money. Update and test your website in a “staging environment” to prevent major issues. All this means is that you have your actual site and a separate test site, and you try any changes on the test site before compromising the actual website. It’s always wise to do a database/file backup, or some other type of method of assurance, so that if everything goes wrong with the changes- or if you accidentally do some kind of irreversible damage- you still have a record of the original site saved and in tact. We hope that you found this guide to WooCommerce helpful as you navigate the process of not only setting up an ecommerce store properly, but also optimizing and maintaining it while learning about and taking advantage of trends along the way. A lot of the tips and “hacks” we shared are not only applicable to WooCommerce stores, although of course that is the focus of the guide. As your business grows and you face new challenges, you’ll probably have more questions and learn more about your options and the capabilities of WordPress and WooCommerce working together. Although there isn’t a full-time support team available to troubleshoot issues like there is for other fully managed ecommerce solutions, there is an active and responsive community of developers and other business owners using WooCommerce that you can get help from free of cost. If you have any knowledge to contribute to our growing knowledge base of all things WordPress, ecommerce, and WooCommerce related, please share with us! The great part about the WooCommerce community is that it’s constantly growing (and doesn’t show any sign of slowing down) with so many new developments in the ecommerce space evolving.